A massive projector has been set up at Occupy Central Hong Kong. They have a system whereby you can submit messages to be projected on their actual wall (not a FB thing). Looks a bit like this (actual size). 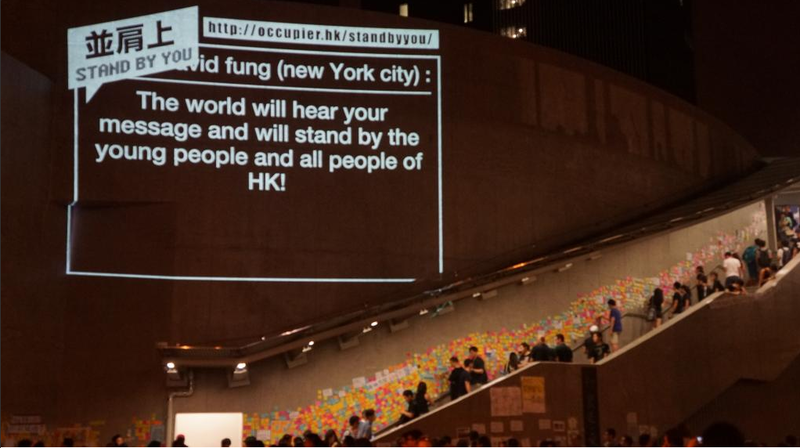 Posted on October 2, 2014, in Actions & protests, Hong Kong and tagged Projector. Bookmark the permalink. 2 Comments. George Soros funds these coups, occupy movements, democracy and freedom riots to effect more regime changes and wars. Same “motis operandi” as in Libya, Egypt, Bahrain, Syria, Ukraine and now in Hong Kong. Once your country is bombed all to hell: recall my words; The Western Alliance, aka UK, EU and US and Saudi Alliance are doing this all over the world — under the guise of freedom. It is a faux freedom — a Trojan Horse — for ethnic cleansing. Agenda21. the ideas you expresses are welcome, but are not new to us. As to external forces being needed to create such a crowd, its debatable in the age of social media and social networking. Its fair to say there were many people and groups struggling for control of occupy both locally and globally. Some point out it was an AstroTurf movement to act as a pressure value before real grassroots dissent began. Either way we have stayed true to the ideals of occupy and treat the struggle as follows. Its a battle for what the general public believe about the world around them. Tents in parks is not currently the correct vehicle for that. Un-spinning the mainstream media (MSM) is a viable activity. Showing people the lies politician try to hide is a viable activity. Speaking your mind and having fair debates online is a viable activity. I you have done so recently maybe you should watch the Matrix (1999). there is a good review here which raises some interesting points.